Many parts of the world harbor numerous small snakes that have specialized for one or another limited food source. Many such snakes, such as the Red-bellied Snake of the northeastern United States, are common though not usually noticed. 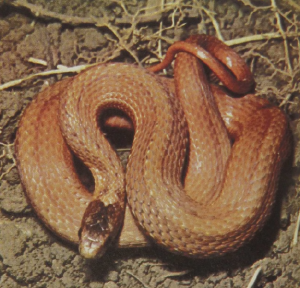 The Red-bellied Snake is less than a foot long, gives birth to from ten to 20 live young during the summer, and may be generally recognized by a dark-brown to blackish dorsal color and a bright-red belly. While it will also take other invertebrates, the Red-bellied Snake has specialized for feeding on slugs. When about to feed, the snake curls its lips out and up, as if it were sneering. It then bites tha slug and very rapidly pulls it into its mouth by action of the upper and lower tooth rows. The process proceeds very quickly in order to limit time for the slug to produce mucus and thereby prevent the labial scales, which remain curled out of the way, from becoming fouled.